Leonardo Jardim is back in charge of the French club after Henry was sacked on Thursday. 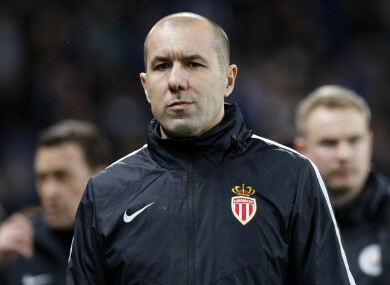 Jardim is back in the Monaco hot seat. MONACO HAVE CONFIRMED the sacking of manager Thierry Henry after just 20 games in charge of the relegation-threatened Ligue 1 club. The former Arsenal and France striker was initially suspended earlier this week but his permanent departure has now been confirmed. Leonardo Jardim, who was sacked by the club in October, has taken over and signed a two-and-a-half year contract. Henry succeeded Jardim with great fanfare in October but has struggled to secure consistent results in what is his first managerial role, having previously been an assistant to Roberto Martinez with Belgium. He managed just five wins in 20 games in all competitions and failed to pull the club away from the relegation zone. “Thierry Henry is a football legend but due to a very unfavourable mix of circumstances, including, above all, numerous injuries to our players, hampered him from quickly and effectively leading the team out of the crisis,” Monaco CEO Vadim Vasilyev said in a statement. I want to express my gratitude to Thierry Henry for accepting this challenge and trying to lead the team of his former club during such a difficult period. The 41-year-old has been busy in the January transfer window, bringing in four players including Chelsea midfielder Cesc Fabregas, but those new faces have failed to spark an immediate upturn in results. Monaco are without a win in four matches in all competitions and haven’t won in five in the league, stretching back to the start of last month. Last weekend they were thrashed 5-1 at home to Strasbourg, a result that left the principality side 19th in Ligue 1 and three points from safety. Email “Monaco replace Henry with former coach - three months after he was sacked ”. Feedback on “Monaco replace Henry with former coach - three months after he was sacked ”.